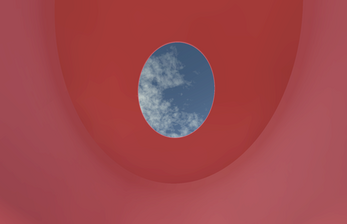 One hour in a James Turrell Skyspace: The Color Inside is a first person game were you spend an evening in an art installation called The Color Inside by the American artist James Turrell. You can walk around (with W, A, S, D on the keyboard) and look around (with your mouse). Turrell's work is all about the fundamental materials: space, time and light, and is usually focused on permanent installations. His most famous works are the Skyspaces. A Skyspace is (most of the times) a room with a hole in the ceiling that allows to see the sky above, with nothing in between. At specific times during the day — at sunrise and sunset — a hidden strip of LED lights color the room, rotating trough the whole color spectrum. 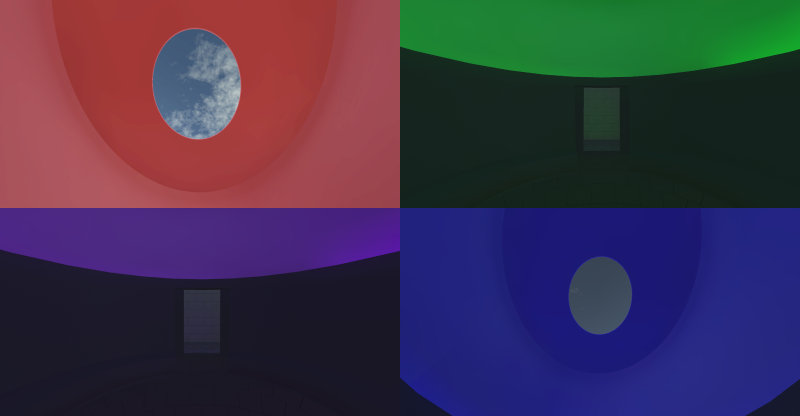 And if during the day the hole in the ceiling simply frames the sky, during the light show, filtered through a cloud of colored light, the view of the sky is altered. The sky can become pink, green, deep blue. It’s a beautiful spectacle. In this game, you sit for one hour in a Skyspace, specifically you are in The Color Inside, a Skyspace built in 2013 at the The University of Texas at Austin. You play in a chill evening, looking up at the sky and enjoying the sunset light show. If you are downloading the Mac version: unzip the file > right click (two fingers click on most trackpads) > Open. Then, confirm that you want to open the game when asked.